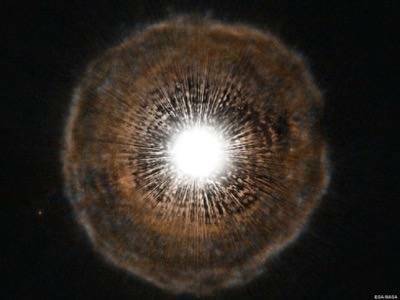 The star U Camelopardalis is about to die, and NASA’s Hubble telescope has captured a stunning image of one of its last gasps. It’s a rare kind of star composed of more carbon than oxygen, giving it low surface gravity compared to other stars. Consequently, U Cam releases bubbles of gas every few thousand years – a blink of an eye in stellar terms – as its core begins to fuse. NASA predicts the star has only a few hundred years left before it collapses. See the full-size image on NASA.gov.